There are few plays in the entire theatrical repertoire as funny as classic French comedies-of-manner. For years, though, English translations have been hobbled by the requirement that all the text be written in rhymed couplets. Too often, the results did not flow trippingly upon the tongue. But in recent years, the extraordinary adaptations by marvelously gifted playwright David Ives have come to the rescue and provoked many a delightful revival of these classics. Delightful is just the word to describe Center Repertory Company’s hilariously funny production. 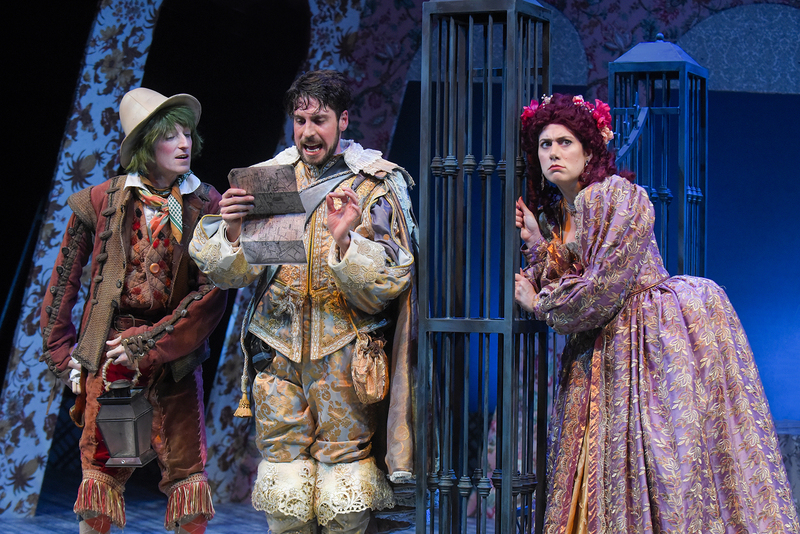 Skillfully directed at breakneck speed by Michael Butler, the eight member ensemble squeezes more laughs out of this old workhorse than there are thieves in Washington. Master seducer Dorante (the charismatic Jeremy Kahn) cannot tell the truth, while his servant Cliton (Joseph Patrick O’Malley) cannot tell a lie. When these two are turned loose in Paris and encounter the beautiful friends Clarice and Lucrece, the attempted seduction becomes absurdly complicated by Dorante’s bottomless imagination. The plot is tangled and irrelevant. It serves as a premise for some very funny staging and a nonstop assault of witty puns and linguistic somersaults from Ives and Corneille. This is an ensemble that is perfectly matched, with no minor parts. The eight actors are as tight as any rock band. In fact, they open the second half of the show AS the funniest rock band (“The Liars”) ever, and there’s even a surprise operatic aria thrown in for good measure. Why not? Special call-out to Craig Marker as the suspicious lover, Alcippe, who is not only a laugh riot, but finds an emotional core to his character that rings true even in the most ridiculous moments. Monique Hafen is wonderful fun as twin sisters Isabelle and Sabine−one of easy virtue and the other a stick-in-the-mud. Sharon Rietker and Lyndsy Kail are great to watch as they make mincemeat of Dorante and his fibs. Howard Swain is full of fine foolery as Dorante’s father, and Teddy Spencer does a lot with a small role as a foppish courtier. If you attend this play, and don’t laugh, you’d better call in a doctor. You’re probably comatose. “TheLiar” continues at the Lesher Center for the Arts through November 18th. For further information, click here. “The Liar”, by David Ives adapted from the comedyby Pierre Corneille, produced by Center Rep. Director: Michael Butler. Scenic Designer: Erik Flatmo. Costume Designer:Victoria Livingston-Hall. Lighting Designer: KurtLandisman. Sound Designer: Cliff Caruthers. Cliton: Joseph Patrick O’Malley. Dorante: Jeremy Kahn. Clarice: Sharon Rietkerk. Lucrece: Luyndsy Kail. Isabelle/Sabine: Monique Hafen. Alcippe: Craig Marker.Philiste: Teddy Spencer. Geronte: Howard Swain. Posted in Reviews.Tagged Center Rep, Charles Kruger, Craig Marker, DavidIves, Michael Butler, Pierre Corneille, San Francisco bay area theatrer reviews, The Liar, theatrestorm.